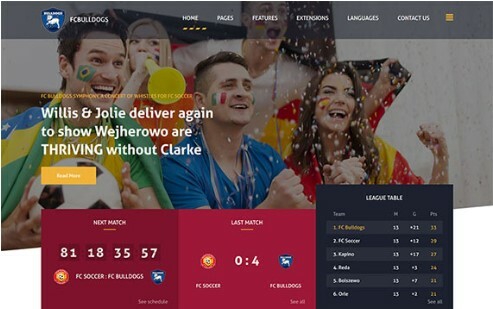 JM Sport is a club news and sport Joomla template that is a great choice for sports websites, like a football, soccer team or league website, running clubs, sports events, sports news online magazine or children's sports clubs and sections. This sport Joomla template was designed having sports in mind so it fits perfectly with all kinds of sports content. For a football sports team the template uses DJ-League league management component and for running events version the template has many useful ready to use custom codes to showcase previous and upcoming events, results and table, awards and next event counters, sports games and matches galleries. For a sports news magazine, it has few blog layouts, news showcase sliders and galleries, news tabs and accordions for content like articles or modules.